TEHRAN (FNA)- Tehran and Islamabad have agreed on a revised price formula and a new price review mechanism for Iranian gas that will be piped to Pakistan, a senior Iranian official said. The new formula and review mechanism update terms reached in 2006 during the long-running negotiations on the project that are part of Iran’s effort to become a major gas exporter. Hojjatollah Ghanimifard, the Iranian oil minister’s special representative to the pipeline talks, said both sides agreed to amend terms because of changes in the energy market since 2006. He said agreement was reached after two days of talks in Tehran. “We agreed that the formula should be changed,” he told Reuters, adding that the price review formula was also amended. “One of the changes (to the review formula)… was that a year before the commencement of delivery of the gas we are going to have a price review. Of course, this can be an option that either side can use,” said Ghanimifard, who is also a senior official in the state-owned National Iranian Oil Company. He said the changes have to be approved by the authorities in both countries, after which details would be announced. This could lead to setting a date for signing a contract, he added. “Almost five years after the contract is signed we hope that the commencement of gas delivery starts,” he said. India had been part of the $7 billion pipeline project, but stayed away from talks in September saying it wanted guaranteed security of supplies as the pipeline should go through a restive province in Pakistan. Iran and Pakistan initiated a Gas Sales Purchase Agreement earlier this year. On April 30, Ahmadinejad met Indian Prime Minister Manmohan Singh and said that the two sides had decided to address the issue in 45 days. Indian and Pakistani officials also announced earlier this year that they had resolved almost all bilateral issues including transit fee which saw New Delhi boycotting IPI pipeline talks for about a year. In June, Pakistan Foreign Minister Shah Mahmood Qureshi, who met New Delhi’s Oil Minister Murli Deora said that the two sides have resolved all bilateral issues. India has more or less agreed to give Pakistan a transit fee of $200 million per year, which is equivalent to $0.60 per million British thermal unit for allowing passage of the pipeline through that country. India and Pakistan finally agreed in February 2007 to pay Iran $4.93 per million British thermal units ($4.67/GJ) but some details relating to price adjustment remained open to further negotiation. There was a breakthrough in the talks in April 2008 when Iranian President Mahmoud Ahmadinejad visited Pakistan and India. According to the project proposal, the pipeline will begin from Iran’s Assalouyeh Energy Zone in the south and stretch over 1,100 km through Iran. In Pakistan, it will pass through Baluchistan and Sindh but officials now say the route may be changed if China agrees to the project. The gas will be supplied from the South Pars field. The initial capacity of the pipeline will be 22 billion cubic meter of natural gas per annum, which is expected to be later raised to 55 billion cubic meter. It is expected to cost $7.4 billion. According to Indian ministry sources, the IPI gas pipeline is quite crucial for New Delhi as after signing of the agreement, 60 million standard cubic meters per day (mmscmd) of gas is expected to be supplied in phase-I, which will be shared equally between India and Pakistan. In phase-II, 90 mmscmd of gas will be supplied to India and Pakistan. So far six meetings of the trilateral joint working group (JWG) of the participating countries have been held with the last meeting being held in New Delhi on June 28-29, 2007. India, Asia’s third-largest economy, can produce only half the gas it needs to generate electricity, causing blackouts and curbing economic growth. Demand may more than double to 400 million cubic meters a day by 2025 if the economy grows at the projected rate of 7 to 8 percent a year, according to the Indian oil ministry. Iran plans to start exporting gas to Pakistan in 2011. Iran has completed half the pipeline, which can carry 110 million cubic meters of gas a day, National Iranian Gas Company (NIOC) said in April. 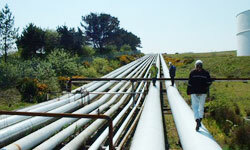 India uses about 108 million cubic meters of gas a day, according to a BP Plc report. Iran, which sits on the world’s second largest reserves of both oil and gas, is facing US sanctions over its civilian nuclear program. Iranian officials have dismissed US sanctions as inefficient, saying that they are finding Asian partners instead. Several Chinese and other Asian firms are negotiating or signing up to oil and gas deals. In a last case, Iran signed gas deals worth $14 billion with Malaysia’s SKS Group in early December, including a contract to build an LNG plant. Following US pressures on companies to stop business with Tehran, many western companies decided to do a balancing act. They tried to maintain their presence in Iran, which is rich in oil and gas, but not getting into big deals that could endanger their interests in the US. Yet, after oil giants in the West witnessed that their absence in big deals has provided Chinese, Indian and Russian companies with excellent opportunities to sign up to an increasing number of energy projects and earn billions of dollars, many western firms are increasingly showing interest to invest or expand work in Iran. Some European countries have also recently voiced interest in investment in Iran’s energy sector after a gas deal was signed between Iran and Switzerland regardless of US sanctions. The National Iranian Gas Export Company and Switzerland’s Elektrizitaetsgesellschaft Laufenburg signed a 25-year deal in March for the delivery of 5.5 billion cubic meters of gas per year. The biggest recent deal, worth €100m ($147m, £80m), was signed by Steiner Prematechnik Gastec, the German engineering company, this year to build equipment for three gas conversion plants in Iran. Washington and its Western allies accuse Iran of trying to develop nuclear weapons under the cover of a civilian nuclear program, while they have never presented any corroborative document to substantiate their allegations. Iran denies the charges and insists that its nuclear program is for peaceful purposes only. Despite the rules enshrined in the Non-Proliferation Treaty (NPT) entitling every member state, including Iran, to the right of uranium enrichment, Tehran is now under four rounds of UN Security Council sanctions for turning down West’s illegitimate calls to give up its right of uranium enrichment. Tehran has dismissed West’s demands as politically tainted and illogical, stressing that sanctions and pressures merely consolidate Iranians’ national resolve to continue the path. The UN sanctions address individuals and companies involved in nuclear- and arms-related activities without banning daily trade and non-nuclear investment. But the US has imposed unilateral restrictions in particular on financial transactions and big investments. Political observers believe that the United States has remained at loggerheads with Iran over the independent and home-grown nature of Tehran’s nuclear technology, which gives the Islamic Republic the potential to turn into a world power and a role model for other third-world countries. Washington has laid much pressure on Iran to make it give up the most sensitive and advanced part of the technology, which is uranium enrichment, a process used for producing nuclear fuel for power plants. Washington’s push for additional UN penalties contradicts the report by 16 US intelligence bodies that endorsed the civilian nature of Iran’s programs. Following the US National Intelligence Estimate (NIE) and similar reports by the IAEA head – one in November and the other one in February – which praised Iran’s truthfulness about key aspects of its past nuclear activities and announced settlement of outstanding issues with Tehran, any effort to impose further sanctions on Iran seems to be completely irrational.